Wanna Hack an extremely secure Computer? You do not need sophisticated techniques or equipment to do so. To hack an Air-Gapped computer – All you need is a cell phone; even old-fashioned, dumb phones from the past decade will work. Yes, Hacking Air-Gapped Computers is possible using a basic low-end mobile phone. Israeli security researchers have devised a new attack to steal data from a computer that is isolated from the internet and other computers that are connected to external networks, also known as an air-gapped computer. The research was conducted by lead security researcher Mordechai Guri, along with Yuval Elovici, Assaf Kachlon, Ofer Hasson, Yisroel Mirsky, and Gabi Kedma – the same researchers who developed a previous attack that used a smartphone to wirelessly extract data from Air-Gapped computers. Moreover, few months ago, these researchers devised an attack to hack ultra-secure air-gapped computers and retrieve data using only heat emissions and a computer’s built-in thermal sensors. 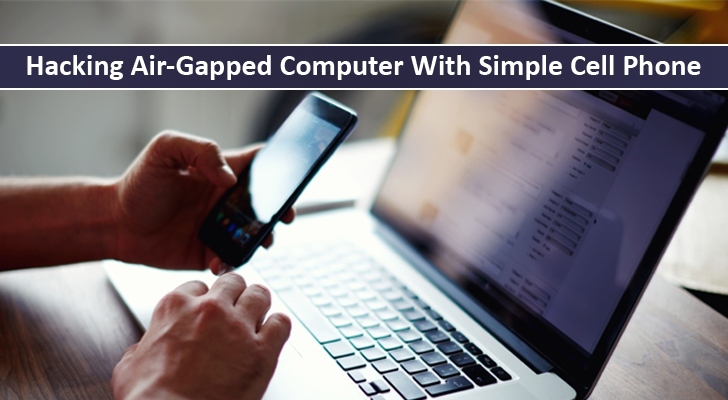 In the demonstration, the researchers used a 9-year-old Motorola C123 phone that lacks modern-day smartphone’s functionalities like a mobile data connection or Wi-Fi. The researchers then installed a particular kind of malware on both the mobile phone and the target computer. Once installed completely, the researchers were able to exfiltrate data via electromagnetic waves that computers naturally emit. This whole attack relies on having malware installed on both the air-gapped computer and the phone, meaning an attacker need first to hack the target computer. Unlike some other "recent work in this field, [this latest attack] exploits components that are virtually guaranteed to be present on any desktop/server computer and cellular phone," researchers note in their research paper. Wired notes this attack could allow hackers to steal sensitive information including passwords, encryption keys, or even the GPS coordinates from the highly secure air-gapped computer that are often used in classified military networks, the payment networks, and industrial control systems that operate critical infrastructure of the Nation.